The MCC Cricket Library and Boundary Books are proud to announce an important new contribution to cricket, football and social history. Albert Craig, often referred to as The Surrey Poet, was a one-off. Born of illiterate parents in a remote Yorkshire community he travelled the country and became one of the most celebrated figures on the cricket and football grounds of London and the south. Years of painstaking research have produced an unbelievably detailed account of Craig’s rise to become almost as famous as WG himself, simply by selling his printed rhymes at a penny a sheet. 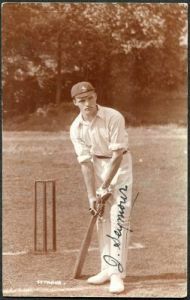 With his natural wit and spontaneous repartee, he was an integral part of the day’s entertainment on the cricket grounds of the Golden Age - and he was equally at home during the formative days of Arsenal football club.